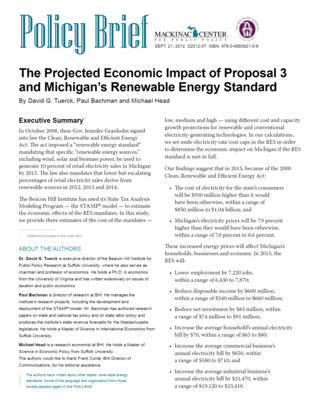 The Mackinac Center for Public Policy recently published with the Beacon Hill Institute “The Projected Economic Impact of Proposal 3 and Michigan’s Renewable Energy Standard,” which addresses Proposal 3, the so-called “25 x 25” initiative, on the Nov. 6, 2012 ballot. The policy brief is authored by David G. Tuerck, Paul Bachman and Michael Head of the Beacon Hill Institute. The proposed constitutional amendment would mandate a 25 percent renewable energy standard for Michigan by 2025. The policy brief estimates the cost of the mandates using the State Tax Analysis Modeling Program – or STAMP – to determine the economic impact on Michigan. They determine that the ballot measure would impose higher electricity prices and economic costs than are sustainable or environmentally friendly.